Apr 19 We've just been told about the new prices from the manufacturer. Luckily we still have some stock at the old prices so if you're looking to buy then contact us asap! Apr 19 There will be some new cages in the range soon. All to be revealed on our brand new website! We're currently looking to increase our library of pictures and we're offering decent discounts to anyone wanting the new Single X Large Low crate. The catch is that you need to come to Westerham in Kent to collect. Please email info@safedog.co.uk or call 020 8658 0002 for details. 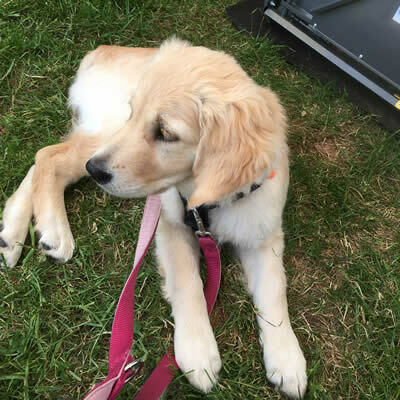 May 18 We loved Ellie so much (and our previous golden Baloo) that we decided to get another gorgeous golden to join our family. Our flatcoat is now enjoying having another playmate, pictured here at the show at Ardingly. At some angles she takes my breath away as she's so much like Ellie. She was a little star at the show, very well behaved, albeit she's been out to lots & lots of places with us so takes everything in her stride. Just weeks after Ellie's 14th birthday celebrations we had to make the devastating decision to help her on her way to Rainbow Bridge. We have many happy memories - she was with us at our wedding in Gretna Green, she came to Crufts with us as well as many other shows and she had many lovely holidays - including a visit to Guisachan where the first golden retriever was bred. We went to dog training clubs from 2003 right until the end. But most of all we miss the day to day habits - helping with the dishwasher, loving her tennis balls, drooling when treats were on offer and our big cuddles. She wasn't a barker - unless you were preparing food for her indoors and she was outdoors! Happy to say that Ellie, our golden retriever, celebrated her 14th birthday this month. She was the runt of the litter - her breeder was told that she wouldn't survive but she bottlefed her as she was determined that she would live. Ellie spent much of her life with one or two dobermanns and certainly stood her ground with them. She now has just one 'sister' - a two year old flatcoat. Ellie has severe arthritis but we're managing it with drugs, Galen Myotherapy and driving her to the park rather than walking her. She's a slim dog (25-27kg) which helps - our vet says that fat dogs are often housebound at this age. Ellie's had a variety of diets over the years, but following some gastric problems after medication which didn't agree with her she can no longer tolerate raw food. Currently she eats Chappie / home cooked fillet of white fish / Platinum & sometimes home cooked chicken (has to be lean). We get many requests for charity donations/sponsorship. The Safedog crates were designed to protect humans and dogs so we like to support charities which reflect the human/canine partnership. We've known Stuart & his team at NSARDA Kent for many years now, so when they told us about their new Search & Rescue vehicle we offered them a Double X Large crate. Here's Derek handing the crate over to Stuart last week. The team are out in all weathers searching for missing people. Keep up the good work Kent Search & Rescue Dogs - Nsarda Kent. Apr 16 At the Newbury All About Dogs show we welcomed Denver to our stand. Did we sell his family a crate? No we didn't - they already have one - in fact they were our very first customer back in 2007! We've seen Denver from time to time as he lives locally, but he is now the face of www.fidosbox.co.uk - a service providing monthly treats for your dog(s). We wish them all the best in their new venture and look forward to seeing them as neighbours again at future shows. Three years ago I had to take our dobermann boy, Beau, to a referral centre. Although Beau was small at 30kg I could lift him out of the crate but struggled to get him in comfortably. My lovely friends lent me a dog ramp as they had two, and said they weren't in a hurry to have it back. We returned it last month as we now have our own - one that we now sell. Our friends preferred our new one to either of theirs, so we gave them one as a 'thank you' present for the loan. 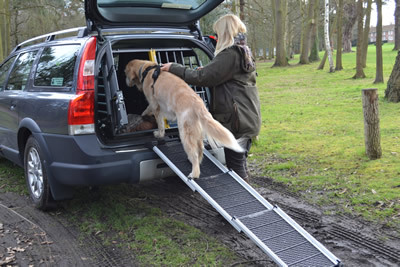 The dog ramp, pictured right, is available from stock at £140, which includes delivery to any UK mainland address. I like the ramp because it's lightweight, so I can use it with one hand whilst holding the dog on a lead in the other. It's telescopic, so folds down to a reasonable size for transportation. It's also variable in length - in the photo it's full length, but if someone parks too close to you then you can make it shorter (albeit it's then steeper). My 12 year old golden retriever is arthritic so we've used a ramp for her for quite some time. It takes up to 85kg in weight. Welcome to our latest distributor, The Big Pet Store in Halesowen, West Midlands. Darren Burke and his partner have two rescue dogs from Crete (Walter & Ernie) apparently they misbehave sometimes (are any dogs perfectly behaved all the time?!) Darren's Dad Mike and his partner Shirley have Sadie a miniature schnauzer rescue and Toby a pointer lab cross rescue. There's lots of lovely things at the store to buy apart from our crates - when Derek visited to set up the crates he managed to find a few presents for our own dogs. We are devastated by the loss of our lovely Dobermann boy Beau. He reached the grand old age of 13 despite having arthritis, Cushing's and finally cancer. He was one of the three original 'Safedog dogs' along with his Dobermann and Golden Retriever sisters. Our proudest ever moment when we heard that we'd received an award for our Canine Bloat Awareness campaign! 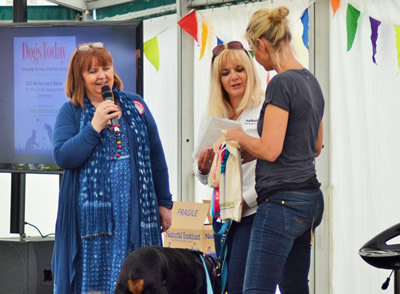 Beverley Cuddy told the audience about the campaign whilst Ulrika Jonsson presented the award. The rosette matched Beau and Ellie's leads! Beau was a bit wobbly on the stage, but I was really keen for him to be up there with me as the campaign was all due to his torsion. The award was sponsored by Natural Instinct who gave us a very generous prize (we already knew how good their food was). The success of the campaign is thanks to everyone who's shared the information. Thank you all. After twelve hours of filming, Noel spared us some time to receive a cheque for £1,200 for The Humanimal Trust. Thanks to each and every one of our customers for making this possible! 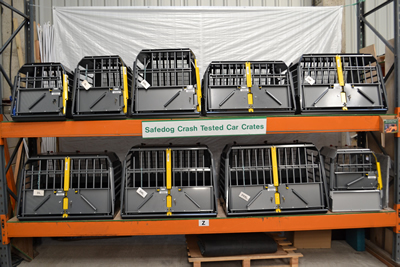 The charity is one set up to benefit humans and animals so is a natural fit with the Safedog crates. It was a very poignant moment for us all. Noel had performed several operations on Beau after he went lame, which gave him some happy years running around. Beau had been diagnosed with cancer earlier in June so we knew that this would be his last public appearance. 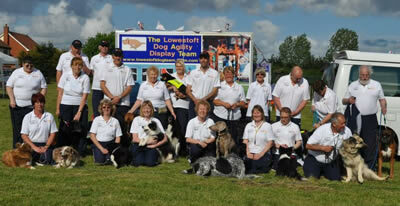 Kev and Terri did their first show of the season on 14-15th March. 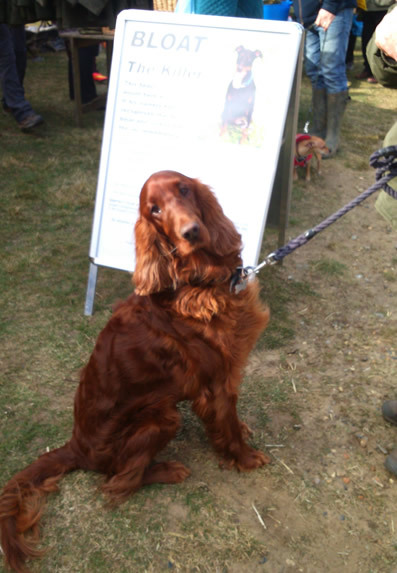 The highlight of their weekend was meeting Sasha, this gorgeous red setter. 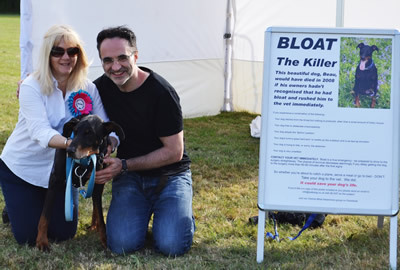 Sasha's owners had picked up a bloat flyer at one of the shows last year. Not long afterwards Sasha suffered bloat. Her owners recognised the symptoms from the flyer and rushed Sasha to the vet, who managed to save her. She's an absolutely stunning dog, pictured here next to the Bloat poster. Mar 15 We were in Hall 1 for the first time at Crufts15 - not so many dogs walking past the stand so we didn't have the opportunity to grab any for photoshoots! We were pleased to meet several existing customers - and some new ones too! Our own dogs were with us on the stand for the first time - normally we get house sitters but I'm really not prepared to leave elderly dogs at home now. Sorry if you couldn't get to speak to Derek on the stand on the Thursday or Friday. Our dobermann had been poorly so I stayed home with the dogs and drove up on Friday for the weekend. But if you saw the crates and liked them you can always ring/email with any questions. We also run the Canine Bloat Awareness campaign, so we handed out lots of flyers detailing the symptoms. 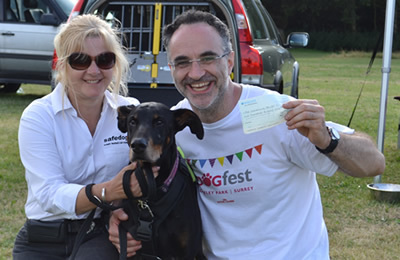 Aug 14 At Dogfest on 9th August 2014, Safedog was proud to present a cheque for £1,000 to Noel Fitzpatrick (aka Supervet) for his charity The Humanimal Trust - the first UK charity set up to advance animal and human healthcare in tandem through shared ideas and technology where both species truly benefit, not just humans benefiting at the expense of animals. Beau, our dobermann, has been operated on several times by Noel so he had to be in the picture too! May 14 Ooh, just realised that we hadn't updated this page for ages! We've had a busy year, quite stressful as our dobermann, Beau, was very poorly for the first 2-3 months. Happy to say that he's pulled through and celebrated his 12th birthday in March! He also gave his seal of approval to our Norfolk distributors - Kevin and Terri Groom. The Grooms helped us on the trade stand at All About Dogs in Suffolk over the Easter weekend. As soon as they arrived at the showground we invited them into our caravan for tea. Beau immediately hopped onto the sofa in between Kev and Terri for a cuddle! The Grooms are now going to be doing shows in the Suffolk/Norfolk/Cambridgeshire areas. This is their trailer which we think looks fantastic ... albeit it's not a tardis, so if you're going to a show specifically to buy a crate then let them know in advance what you'd like to reserve. Show dates will be updated on Facebook and our show page. Dec 13 Terri and Kevin's crate showroom in the shop (see last post) was so popular that they quickly extended the range of crates after Kev had made a purpose built shelf in the garage behind the shop to accommodate more of the range. We're pleased to announce that we have appointed our first distributor in Loddon, Norfolk. He's on the Norfolk/Suffolk borders, so anyone in those two counties wishing to go and see the crates with a view to buying them won't have to visit us in Kent! Pop in to have a look (but if you're travelling a distance then it may be a good idea to call in advance so that the crate expert is there - Kevin Groom - on 01508 528 909). Pictured right is the display of some of the crates in the shop; Kevin also has two more crates available for viewing in his own vehicles. Welcome on board Kevin & Terri! June 2013 We're delighted to announce that one of the most popular 'dog' hatchbacks, the Honda Jazz, is now featured on our website. Check out the Honda Hatchback page to see the two gorgeous occupants of this new crate. Thanks to their Mum for sending us the pics! We are delighted to announced the arrival of our new Mini Max crate. Like our original crates they're designed to fit into the back of estate cars, 4x4s and people carriers, but they're smaller to accommodate little dogs - and the crate bars are closer together. Like the original crates they extend - in this case from 22.5" to 30.5" in length, they're 21" wide and 18" high. Priced at £395 which includes delivery of a flatpacked crate to any UK address. May 2013 We've had several enquiries over the years from people wanting to use the crates for cats, birds of prey, camera gear ... and horses! 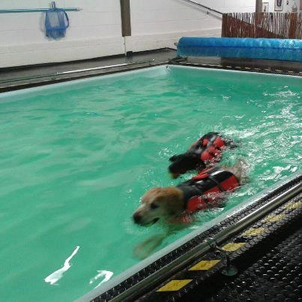 Our Dobermann Beau used to hate the water, but after a series of operations by Noel Fitzpatrick he grew to love his hydrotherapy sessions. Our Golden Retriever was diagnosed with arthritis last month so we searched for somewhere to take the pair of them for a swim. We were lucky enough to find The Brook, near Maidstone in Kent. We can swim with the dogs if we want to and the pool is long enough to do laps in. It's only been open since mid 2012 but already Karl has built up a regular client base. Sadly this facility is now closed - but we thoroughly enjoyed our sessions there. When Beverley Cuddy, Editor of Dogs Today magazine, put out a request for a crate for the new Hounds for Heroes vehicle we decided that it was a charity we'd like to be involved with. The Head Trainer brought the car to the warehouse to get the crate fitted in the new Skoda Octavia. The car is more spacious than it looks (takes a Double X Large crate up to 38") and could easily accommodate two labs or two golden retrievers with a central divider installed. We wish Hounds for Heroes every success. We sold our first hatchback crate today. After many years of telling people that we would be selling them 'one day' that day was today (our golden retriever's ninth birthday)! The crate is pictured in a Nissan Qashqai and is owned by a Swedish Vallhund and family. The new (3G) version of the crate is launched. There's a few differences: the door closure is more sophisticated; the escape hatch is metal mesh rather than bars (to prevent claws and teeth damaging the back seat); there are fewer parts to make installation easier; and the Single X Small, Single Large and Hatchback crates can usually* be sited on the right as well as the left of the vehicle (useful if you have a seven seater and prefer the left hand seat up). The Single X Large can also be placed on the right, though clearly it wouldn't fit in a seven seater with one seat up in the third row. We now have so many visitors to our Biggin Hill warehouse that we decided to create a 'showroom' with all the crates and tailgate on display. It's still 'work in progress' as we sold the Double Small crate that should be in the gap! The display has been designed so that you can back your car into the warehouse and try whichever crates you like in the back of your vehicle. Of course you're welcome to bring your dogs to try in the crate(s). We accept payment by credit or debit card at the warehouse. 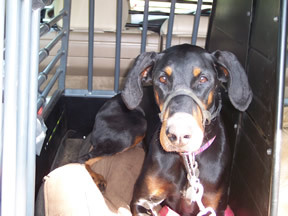 Sadly we lost our beloved dobermann girl Roxy to heart disease. We only had five years with her (she was 18 months when she came to live with us). We knew that we could lose her at any time, but everything was so normal that day that the shock was enormous. We can only be thankful that she didn't suffer. We later took out a full page in Dogs Today magazine in her memory - effectively a bloat awareness poster that may save other dogs' lives. She was the first Safedog harness model (we took pictures of all three dogs in the harnesses but Roxy's turned out better than the others). 14th Feb 2011 Valentine's Day ... a day of eager anticipation, followed by joy or disappointment? It was certainly true in our household that morning. We were awaiting a phone call from the vet to give us an update on Roxy, our dobermann girl, who'd been admitted the previous day when she suffered gastric torsion - worrying in itself but Roxy also has DCM. We were very lucky that the vet saved Roxy's life and she made a full recovery. 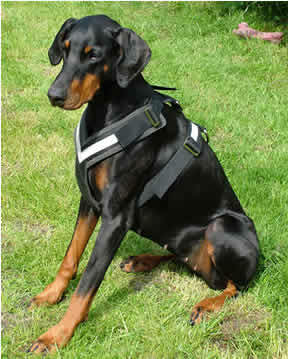 It was after our other dobermann had bloat that we started an awareness campaign. Check out our health page for further details. 3rd Aug 2010 We sold our first crate to a Chihuahua family today. The owners brought along their two smallest dogs so that they could be confident that they wouldn't get their heads through the bars. Having owned dogs ourselves for many years we've been to visit several general and specialist vets. However it made a lovely change to have a vet visit us, to get his car kitted out with a Safedog crate for his gorgeous GWP. We had a stand at the Companion dog show in aid of Dobermann Rescue. We took one of our own Dobermanns with us who thoroughly enjoyed the day, albeit refused to wag her stump in Waggiest Tail class! Well done to Sue & her team who raised £1,600 for the charity.